Maybe it's my fruit-loopy karma, but I often discover that my own experiences with life's situations tend to differ slightly from other people's. I guess it's my reference point. For example, when I lived in Colorado, it was common for people I knew to drive up to North Dakota for the weekend. Only 5 hours away you could pack Mt. Rushmore, Crazy Horse Mountain and a drive through the Black Hills into a weekend of stunning visual delight. Normally the drive from place to place takes you through herds of big horn sheep, pronghorn antelope and hundreds of bison. I know this because I have seen my friends' pictures. However, whenever I trekked up there, somehow I always seemed to miss the masses of animals that everyone else saw regularly. I learned to ignore this and spent my time looking for less dramatic residents, like rock squirrels. Sometimes, you have to focus on the little things in life. They can be important too. Apparently, I brought this trend along with me on this particular dive as well. There was literally nothing in the waters around the Dream. We stared, waiting for the sharks, wrasse and barracudas to come spiraling up out of the depths, the way it happens at the Blue Corner in Palau….. While we were waiting for the magic to happen, I had a moment to focus on the currents of water that were invading my personal space. They were wild, or as I recently read in blog describing the site, "….strong and multidirectional". Trust me, that is an understatement. The issue seemed to be that the various rock features on the ridge were acting like rudders for the hurricane-like current; as the water rushed over, around, between and through the various outcroppings, conditions from one foot to the next were completely unpredictable. The three of us were actually standing only a couple of meters from one another. You'd think we would have all been having the same experience, environmentally speaking. But we weren't. I remember watching with fascination as everyone's gear tried to take off in different directions without the needs of the divers in mind. It was weird. And still no big fish. I glanced out into the channel again and finding it empty, clicked into my "North Dakota" mode and started trying to spot smaller stuff. Actually, considering the torrential current, there were an amazing number of really small critters. I saw a couple of stone fish, and even a small black blenny as well as quite a few barnacles. However, the most numerous inhabitants of the Dream as far as I could see seemed to be urchins. Dozens of them. They were scattered about, tucked into cracks and crevices, hanging on for dear life just like us. It was actually sort of interesting. I pictured the little echinoderms going about their busy day during slack tide, merrily eating the algae on the exposed surface of the reef. I wondered what senses the urchins used to determine that the current was picking up enough that they had to seek shelter, because right now they were all packed tightly into cracks and crevices, obviously waiting for the deluge to end. However, Michael was frustrated with the lack of action on the big animal front. He decided to try and make his way to another spot and motioned for us to follow. Given the torrential currents we were experiencing, that was easier hand-signaled than done. In my efforts to head in the general direction Michael wanted us to travel, I had an issue. Going that direction would expose my face to the wicked current at an angle that would take my mask off. No problem, I am fond of problem solving on the fly. I solved this particular problem by turning my head in such a way that my mask would stay on. There was a downside…..there usually is in my moments of emergency problem solving. This particular downside was that I was not looking in the same direction my body was travelling. As a result I tripped, fell (if such a thing is possible while diving) and found myself rolling as I bounced along the reef. I made an upsidedown-cat-twisting-in-midair-to-right-itself-as-it-falls-from-the-roof maneuver in order to make sure I could grab some solid rock, only to get violently shoved in the opposite direction. I looked up to see what had happened and Michael was pointing, meaningfully, at a patch of reef nearly 12 inches away…..where moments before my bum was about to be planted as I searched for a handhold. There, inches away from me, sat a large, lovely, shimmering Asthenosoma varium. That sea urchin I mentioned earlier. Although the currents around me were demanding my attention and my mask was threatening to journey on without me, I remember focusing on that urchin in a way that left quite an image in my mind to this day. It was stunning. It was tucked neatly into a crack that, because it was angled toward me, would have made a perfect speed bump for a flailing diver's hind-end. Its orange body glowed and its shimmering spines seemed to all be pointing right at me. I think it might have been laughing. It certainly seemed cheerful enough. No doubt I would have survived the encounter. However given the remoteness of where we were, I shudder when I think about the image of myself exiting the water after the dive with a fanny full of poisonous urchin spines. Tearing my attention away from my near-miss, I turned toward Michael to offer a nod of gratitude just in time to witness him cracking his forehead against another rock outcropping as he swung around to try to regain his footing after having shoved me clear of my spiny little friend. The dive was rapidly becoming a complete bust. After only 23 minutes bottom time, we decided to call it a day and head for the surface. Kal's Dream was becoming a nightmare. Now we had a new challenge. Along the same lines as having a tiger by the tail, the exit strategy was proving elusive. The other four-member teams were now becoming visible to the three of us and we watched them climbing hand over hand up the reef toward the surface. We were deeper than some of the other divers so I had a front-row seat as I watched various exits that were attempted. One by one, they got blown off the reef. I saw one diver let go and literally cartwheel away. Another diver seemed to be having better luck until he reached the end of the ridge and got caught in a rather remarkable down current. It was kinda like watching one of those Wiley Coyote cartoons where the bottom drops out from under Wiley, he hangs there anyway for a split second, and then just as suddenly, disappears in a downward direction. 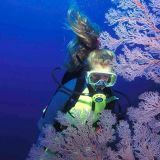 A third diver made it almost to the top of the reef, turned and looked for her buddy, and her mask was ripped off. All in all, if the situation hadn't been so serious, it might have been funny. But this dive was a real milestone for me. I learned a very important life lesson. It turns out you CAN learn something from other people's mistakes. Witnessing these experiences first-hand, I devised a plan. We knew that the top of the Dream was in about 15 feet of water. My plan was to crawl up to the top of the reef, find some solid, urchin-free hand holds, and turn-face-into-the-current for my safety stop. Although the current at that shallow depth with nothing to block it would be unrelenting, with any luck it should also be headed all in the same direction. Hopefully, if I blew up my BC fast enough, I would pop to the surface like a cork. I clearly remember my journey up the reef from 74 feet. I had exactly 3 goals (in no particular order): keeping my grip on the Dream, keeping my mask on my face and keeping all of my body parts urchin-free. As I crawled up the reef, all 3 goals competed vigorously with one another for first place. 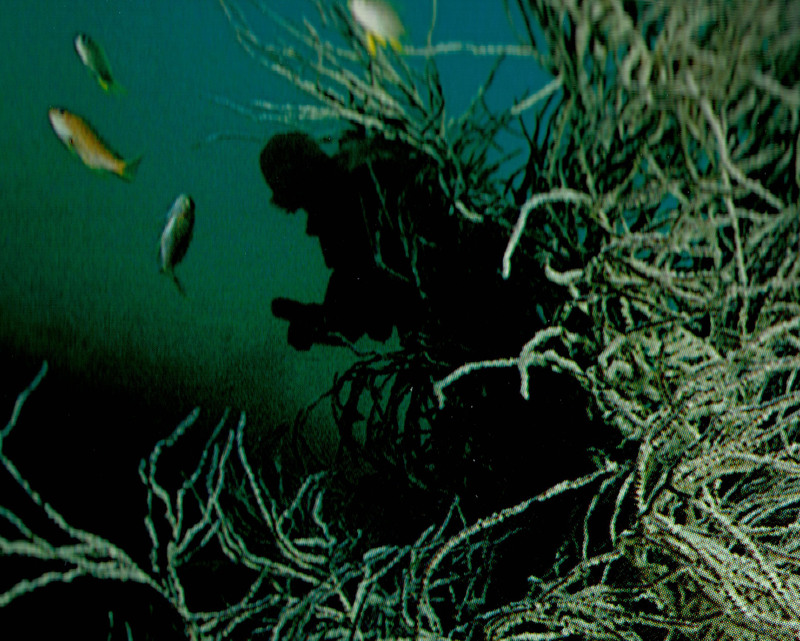 Handholds were rather scarce on the current-blasted reef, and my mask nearly went AWOL several times. Furthermore, the shallower I got the number of urchins seemed to be multiplying faster than rabbits. Eventually, I reached the top of the Dream at 15 feet and felt overjoyed that I was able to see the sunshine clearly again. I sought a solid handhold and turned face into the current for my safety stop, sailing like a flag tied to a pole. 3 minutes later, I grabbed my inflator, said a silent prayer to Poseidon and released my grip on the Dream. My plan worked. I surfaced quickly as I was washed down through the channel and out into the bay where the Baruna was anchored out of the current. It suddenly occurred to me that I had started the dive with a camera, although I had no recollection of its existence during the dive. I looked down. Miraculously, somehow, the Nikonos V was still with me. It was a good sign. The divers were scattered across the bay like leaves in a wind tunnel and it took nearly 30 minutes for the Zodiacs to collect us all. While I bobbed at the surface waiting, I had time to reflect on the stunning sea urchin I had very nearly brought back onboard with me. We hadn't seen the schooling big animals we had expected to see, but I had a very memorable dive nonetheless. Like I said, it's important to have a reference point. Sometimes in life, the little things really do count the most.